Elevating legrest models feature a notched, stainless steel ratchet bar to lock the legrests securely in place. Threaded seat screw inserts reduce stripping from upholstery changes. Padded and upholstered armrests and calf pads are standard. 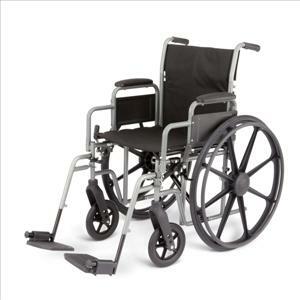 Durable, tig-welded frame with black powder coat finish. Comfortable nylon upholstery. Dual axle hemi-height adjustable. Arm style: desk length removable. Leg style: detachable footrest. Seat size: 16" x 16" (41 cm x 41 cm). 300-lb. weight capacity. Optional accessories: O2 Holder (item MDS85181U), Anti-Fold Device (item MDS85196), I.V. Pole (MDS85183), Overhead Anti-Theft Device (item MDS85197A), O2/I.V. Combo (item MDS85190), Anti-Tip Device (item MDS85189), Tinnerman Legrest Locks (item WCA806991). Narrow.